Everyone needs to participate in self-care, including writers. Grinding away on your work-in-progress every day, while also dealing with life can be mentally and physically straining. Since most writers write on the side, I believe it is even more important for us to participate in self-care because we have so much on our shoulders. 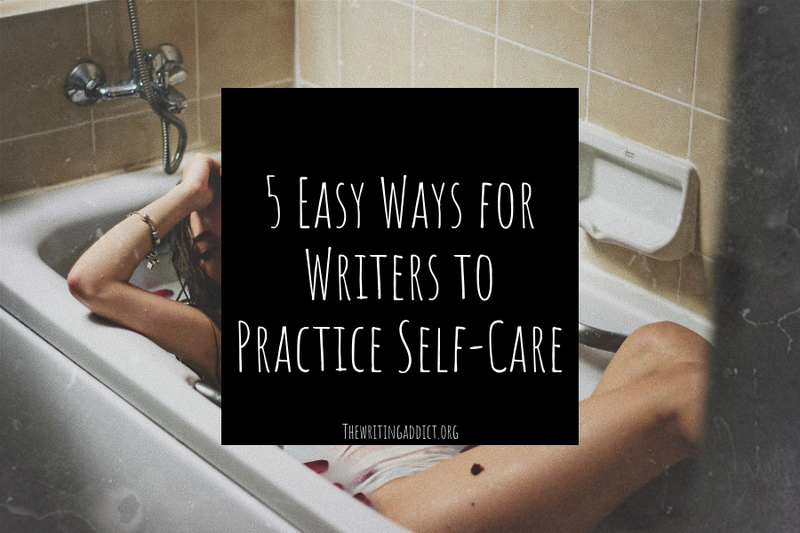 In this blog post, I’m outlining five easy ways you can practice self-care to keep yourself refreshed and writing. Have you been reading books you think you should read? While reading books to improve your craft is great, think of the last time you read a book just for pure entertainment. If it has been a while, it’s time to read something for fun. Pick something you haven’t had time to read or a book you’ve been lusting after for a while to give yourself an easy boost. Nothing beats taking a hot shower or bath after a long day or intense writing session. I don’t have access to a bath right now, so I like to take a long shower with my favorite bath products. Take the time to do things you don’t normally have time for in your daily routine like shaving, doing a face mask, or exfoliating. It will make you feel more relaxed, pampered, and may also inspire creativity. After all, the best ideas come from inside the shower. Have extra money? Treat yourself to something you have been wanting for a while. Examples include blue light glasses to reduce eye strain, a fun writer’s subscription box, or a new book. Remember self-care means investing in yourself emotionally, but also physically. A new item may be just what you need to recharge your batteries. Personally, I bought myself a pair of blue light glasses to help with my eye strain at night. Having a regimented schedule for writing is wonderful for your writing life and productivity, but it can be a strain on your mental health. If you are always grinding away, you can forget to take care of the most important person, YOU! If you’re feeling stressed by your schedule or creatively stifled, take a small break. Whether it is for a day or a week, taking a break can do wonders for your mental health because you are devoting the time you normally don’t have to yourself. Bonus points if you use your small break to do another self-care task on this list. If you are working on a particular project that is draining your energy, a fun idea would be to write something for FUN. A lot of times we can get caught up in finishing a novel, or short story, but when is the last time you wrote something with no pressure? Look up a fun writing prompt on Pinterest (I’ve linked my favorites here) and go to town. Alleviate the pressure from yourself by not expecting the writing to become “a thing.” Instead, write with no qualms and throw it in the trash if you hate it. If you truly love the piece you’ve written, then you can turn it into something. The key here is giving yourself a mental break by allowing yourself to write something with zero pressure. I hope you enjoyed these specific ideas for self-care for writers. Let me know in the comments below your favorite way to give yourself some love. You can also find my favorite self-care/spiritual podcasts here to listen to when you need a pick me up. Great tips for people who write full-time. (I only dabble, here and there.) The long, hot shower is something I try to do daily, as it really helps my arthritis. Getting out of the house and experiencing a change of scenery is good for anyone, as well. Thanks for stopping by The Den recently. Have a good weekend!